3-did I say there are never enough burp cloths .....CLEAN? So what do you give a mother who already has a few children? Chinese Prefold 100% Cotton Diapers (this type are the thickest, smoothest and hold shape after washing the best) I order mine on etsy in the supply category. I usually buy 1 doz at a time for about $25, trust me its worth it. To have this in your stash is very satisfying when you can put together a little gift set in less than an hour. Keep in mind that embellished burpies can run $15-20 each. TIP: I like to wash my fabrics and diapers right away when I get them, that way when I put them away they are ready to use. iron on the adhesive to your scraps, I like to lay my scraps out on the adhesive with the edges touching, then place wax paper over the top, then a pressing cloth before ironing, this way the wax paper will keep the adhesive from sticking to your iron and the cloth will keep the wax off your iron. 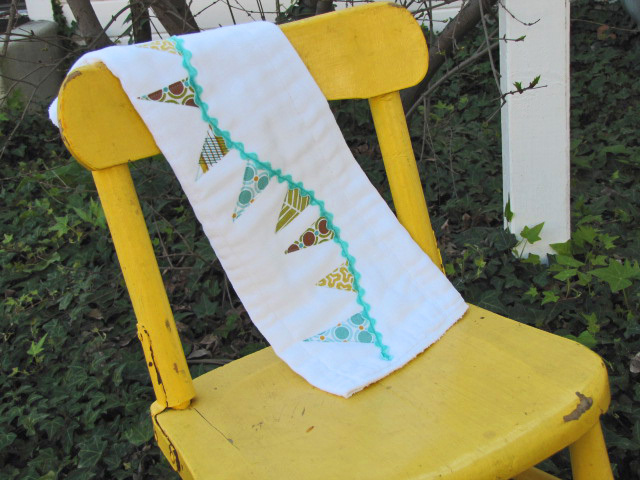 apply the zig-zag by folding under the end and backstitch, then run it along the tops of the flags curving and ensuring you have covered the top of the flags as you sew, fold the end edge as well and back stitch, trip threads....and this project is ready to give! It is hard to believe that there is actually 8 steps to this little simple projects but it really sews up FAST! Is my wife talented or what?! Hi there. Nice blog. You have shared useful information. Keep up the good work! This blog is really interesting and gives good details.Two Wheeler Accessories, Bike Seat Covers.